Katy says: A few weeks ago I asked the readers of this blog to begin forwarding pictures of electoral ads in government offices or buildings, just like this one. 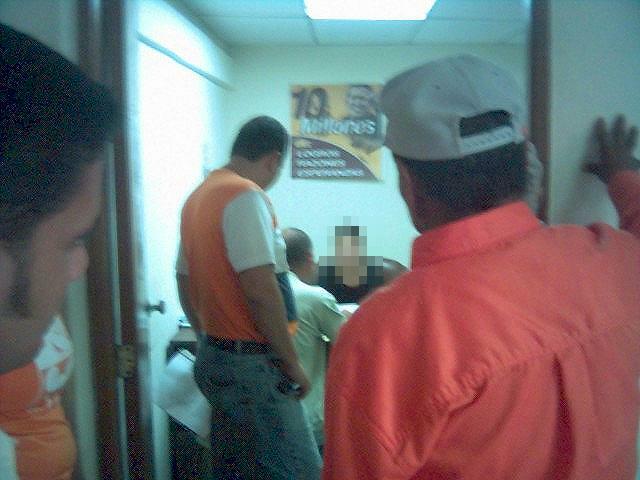 I want to thank the reader who sent me the above picture of an office inside the Labor Ministry in Western Venezuela. As is clear, the Labor Ministry proudly shows a poster of Chavez with the electoral slogan "10 million", as in 10 million votes, a goal that has now been scaled down. Details on the reader or the exact location of the office shall remain, like the person in the photo, confidential. I have not recieved any other pictures, but perhaps Hotmail's junk filter has been playing havoc with my CC email without me noticing. If any of you out there have any more pics, please resend them so I can duly post them. If I get enough of these, I will put them in a separate blog, one with only pictures. My address is katycaracas at hotmail dot com. And kudos to our intrepid photographer!